Looking for suggestions on routes to ride? There’s an app for that. 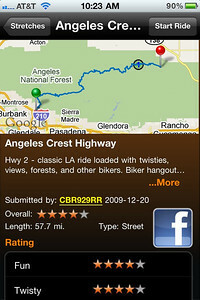 If you’ve got yourself an iPhone, you can put the Greatest Road app in your pocket for free for a limited time. When you’re in an area that you aren’t familiar with, nothing beats local knowledge to help you find your way to the good stuff. I have not used the app yet, but I’m looking forward to checking it out. Have you tried it? Tell us about it!